The first item to consider is the load, which is measured in amperes. This load amperage is the amount of current required to power your device at the line voltage. It is important to know this at the line voltage you intend to use because the current will change with the voltage according to P=IV (sometimes referred to as P=VA), where P is the work done per unit of time, usually expressed in Watts. I (or A) is the electric current in amperes, and V is the voltage. Since P is based on your devices power requirements, it will remain constant, if you lower the voltage, the current must increase to balance the equation, and vice versa. Generally speaking with motors and other industrial equipment, you want to look at the nameplate to confirm the input voltage and the Full Load Amperage (FLA). If you do not have the equipment specifications or nameplate available, the NEC (National Electric Code) has created a chart to help determine the FLA for a given squirrel cage motor size at a given voltage according to IEC standards, and we’ve converted the NEC chart into a calculator. Use it for guidance, but please always refer to the equipment nameplate for the specific information whenever possible as the FLA can vary greatly due to a variety of factors. Choose your motor horsepower, input voltage and single or 3 phase from the drop downs and the calculated full load amperage is displayed. You should next confirm the control voltage to be used to power the contactor. This can be the same as the line voltage, however often a lower voltage is selected for the contactor for safety purposes. Generally, coil voltages are 250V or below. IEC uses utilization categories, or “codes”, to describe specifically the type of electrical load and duty cycle of the load(s). 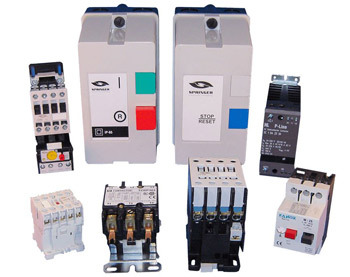 This is important because these will in part, determine which contactor you use. For example, if you have two applications, both using the exact same motor, but in one case the motor will simply be turned on for long periods of time, while the other will be turned on/off constantly, you will likely use two different IEC contactors for each application. The motor that will be turned on/off constantly will require higher current loads and thus require a larger contactor. Below is a chart of the utilization categories for IEC contactors. Choosing the right utilization code will extend the life of the contactor. An incorrectly specified IEC contactor may work for a period of time, but the lifespan will be severely reduced. Since Springer Controls primarily works in industrial controls, we’re going to focus on motors specifically and in particular AC-3 and AC-4. Motors are what we call “inductive” loads, meaning there is an induced voltage due to the rotational effects of the motor. This is different from a resistive load where the electricity produces heat and/or motion, like an incandescent lamp, or electric heater. The most common mistake we see is incorrectly choosing AC-3 when AC-4 would be more appropriate, resulting in a shorter lifespan of the contactor. If a motor will be jogged or have frequent stop/starts, then it should be accounted for by choosing a slightly larger contactor. It’s not just a question of what type of device you are powering, but also how it may be used. Springer Controls sizes our contactors for 10 million operations to ensure long life. Another consideration is whether the motor operation requires reversing of the direction, in which case a reversing contactor would be required. A reversing contactor is an assembly of two contactors (one for each direction) joined by a mechanical and/or electrical interlock to ensure only one contactor is energized at a time. Auxiliary contacts allow additional operations to take place when the contactor is energized. Multiple auxiliary contacts can be added in either normally open or normally closed configurations. A good example for using auxiliary contacts would be turning on a pilot light to indicate the motor is running. Adding additional contacts to a contactor is inexpensive and could save you time and money if you take the time to review the operation as a whole. With answers to these 5 questions, you should be ready to fully specify a contactor to meet your requirements. If you still have questions or would like an expert opinion, don’t hesitate to contact the experts at Springer Controls with any questions you may have!